We left off last time with Francis's tragic early death, the resulting effects on Elizabeth, her marriage to George Warleggan, and her part in her eventual affair with Ross. By this point in the series, she is not the same person she was at the beginning of it. Years' worth of disappointment, loss, and hiding her real feelings have turned her into a very cynical and hardened person. It's sad to me more than it's anything else. Many fans dismiss her contemptuously as a villain by this time because, after all, her choices have gotten her here. Well, yes and no. Many of the choices were hers, but in most of the circumstances in which she found herself, she felt she didn't have another choice. I'd argue that both of her marriages fall into this category. On the other hand, her choices where Ross is concerned are indeed less admirable. And yet, I can't deny that I've found myself far more frustrated with Ross than Elizabeth for much of the show and the books. Here is where the remainder of my thoughts on the subject will focus. After the first three considerations I've laid out in the previous posts, here is one more long one I'd offer. Yes, I’ll argue it. Elizabeth was undeniably guilty in the adultery, but I think there’s a strong case to be made for Ross being more responsible for the grand and complicated architecture of all the problems between them. I love him and truly believe he’s a good man at heart, but he’s also probably the most emotionally incompetent human being in all of fiction. He’s written that way purposely and I think it’s partly why he’s such a great character to watch and read about. He’s both maddening and endearing in many ways, and his relationship with Elizabeth is where I (and many others, no doubt) find him most maddening. He practically turns to putty at the sight of her and his reason leaves far too often when she’s around. There’s no doubt in my head that he’s deeply in love with Demelza, but he slips into fantasizing about Elizabeth far too easily when marriage gets tough. Demelza: I am fierce and proud and steadfast and true and I’ll not settle for second best! Ross: Why would you be? Demelza: Because you love Elizabeth! Because you will always love Elizabeth! Because you cannot conceal your pain that George now possesses her body and soul! Do you deny it? Ross: I do not deny that I loved her. Long before I set eyes on you, she was my first, perfect, untouchable love. Demelza: Whereas I am dull, imperfect, and ordinary. Ross: Not ordinary, but yes, imperfect! Human. Real. What that night with Elizabeth taught me – and God knows there should have been other ways for me to come to my senses, but my arrogance, my idiocy, has been spectacular. 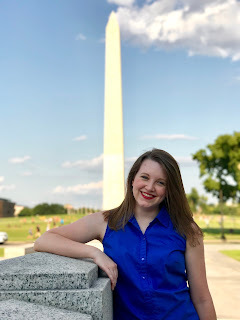 All I can say is after that night – because of it – I came to see that if you take an idealized love and bring it down to the level of an imperfect one, it isn’t the imperfect one which suffers. My true, real, and abiding love is not for her. It’s for you. 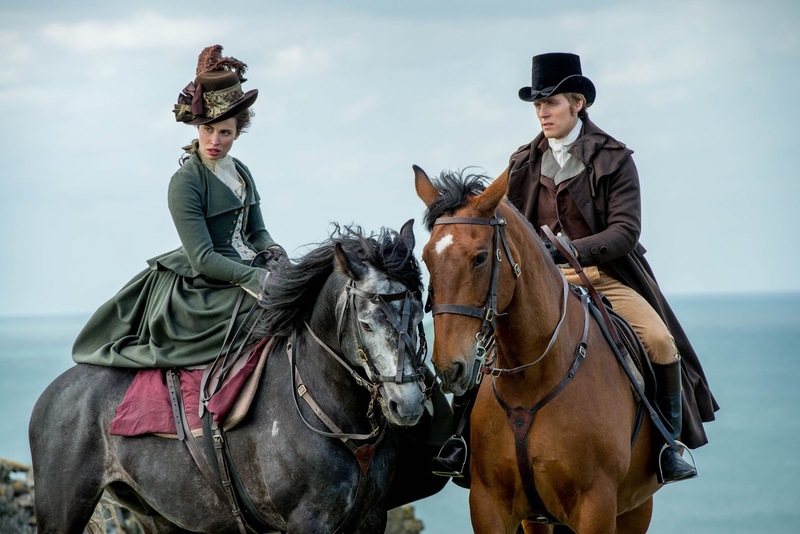 And there’s the rub – the realness of Demelza versus the idealization of Elizabeth. The audience sees it, but Ross can’t get it through his thick head till way later. Elizabeth certainly contributes to the adultery, but if Ross had actively pursued and nurtured his marriage to Demelza from its beginning, he already would have had a strong guard against the baits Elizabeth threw after Francis’s death. Many fans seem to think that everything is Elizabeth's fault because she was baiting him in the first place. Sure, she was wrong to do that, but what about the fact that Ross, you know... RESPONDED to them? And pretty eagerly. If he had kept his cool, maybe prioritized his own wife above Elizabeth, and accepted that Elizabeth is a just a woman, not a goddess, I'd say a lot could have been avoided. If he hadn't taken her baits, she would have eventually stopped throwing them. How can he treat me so? How can he leave things so up in the air?! … He tried to stop this marriage, but offered nothing in return! He has taken what was not rightly his and walked away from the consequences! So there you have it. Elizabeth is certainly a mass of contradictions and has created many problems for every major character in the Poldark saga, but I can’t side with the haters. She makes many regrettable decisions and causes pain to an undue number of people, but I don’t see a villain when I look at her. I see a woman desperate for just a little bit of happiness, trapped by her upbringing, wronged by men she deeply trusted, and very embittered by harsh circumstances. She wants nothing but good for those she loves, but her need to please is consuming and she becomes so very hard. It’s tragic. Really, really tragic. What a thoughtful analysis! I enjoyed reading it and especially appreciated the insights based on the original novels, which, for me, reign supreme. (Not that I don't love the tv series, I do!!) 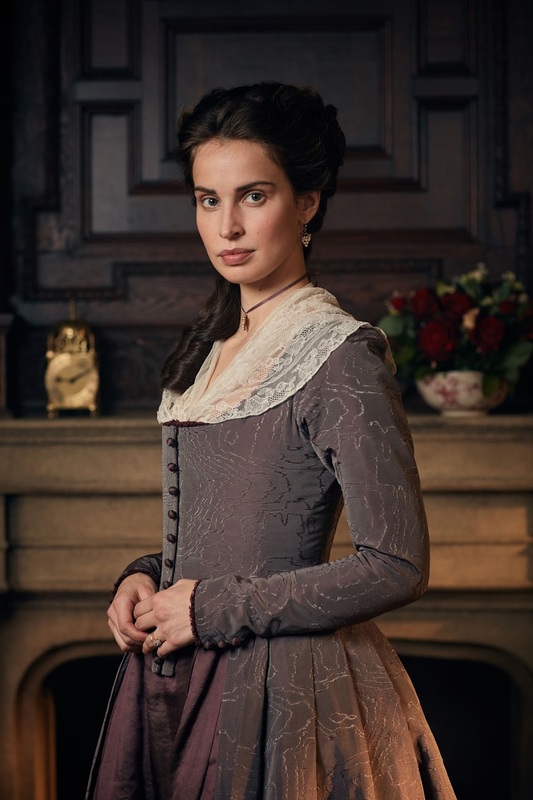 But my opinion of Elizabeth will always be colored by two things: First, her complete disregard of the deep debt of gratitude she owes Demelza, who probably saved the life of her son, and second, her utter blindness (or indifference) to the damage George inflicts on so many people in his lust for status. Even if she truly cannot perceive how callous he is (and I think she does know, deep inside) ... I don't know, for me, that inability to see is itself ... ugh. Just repulsive. (Although I just now remembered that terrible courtroom scene where George condemned the servant who had been abused by the son -- if she didn't know before, Elizabeth certainly discovered then the nature of the man she married. But she does nothing, says nothing.) And one final point: Her shameful role in sacrificing Morwenna to George's ambition. Is Ross blameless? No, certainly not! But I think that if she had been faithful, really faithful, to Francis .... well, I guess we might have had only 8 or 10 wonderful novels rather than 12. Anon, are you referring to the books or the TV series? Because those both actually conflict. 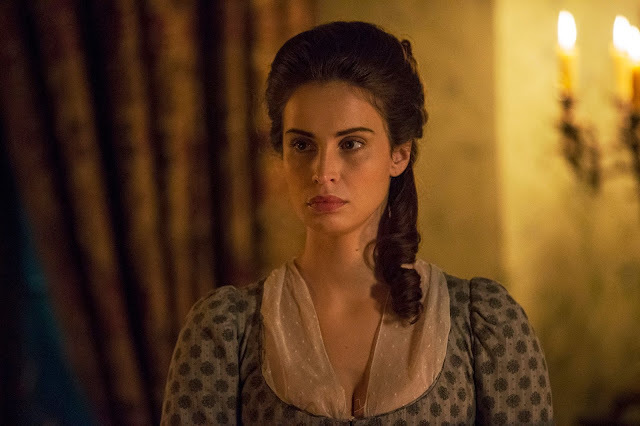 In the TV series, Elizabeth wasn't thankless to Demelza, regarding her nursing of the Trenwith Poldarks while they were ill. She actually came to return the favor 100%, when Demelza fell ill. At this point, it’s also fitting to remember that Demelza didn’t care for Elizabeth and Geoffrey Charles purely out of the goodness of her heart. She did this mainly because she wanted back into Ross’s good graces. For two things. First, she had lied to him and broken his trust, in her aiding of Verity and Blamey’s coming together—thus causing a huge rift between Ross and his remaining family. And then, for her heavy hand in the demise of the Carnmore Copper Company. Also notable, putrid throat takes nearly a week for symptoms to begin showing, so it’s likely or possible that Demelza was already incubating the sickness before she went to Trenwith. On the second point, Elizabeth is very clearly disturbed by George’s tactics. Especially fainting after his rulings as Magistrate. Her inability to ‘say something’ was likely due to a few reasons. For starters, she is a real woman of her time, and women of the time had little to no voice to speak out against the decisions of men, let alone their husbands. Should she have? Maybe. But we’re viewing everything from a modern perspective. I think a lot of times people expect every woman to be as free in her speech and opinions as Demelza. Also, she was in a peculiar position. She was having this child who was not fathered by her new husband. She had to do everything to protect that secret, and for a long time, she was trying to just stay in George’s good graces, so as to not ascended or trigger his anger and set off any suspicions. Selfish and selfless at the same time, but protecting your own is something we all do. She was a really devoted Mother. As for her role in Morwenna’s marriage to Ossie, in the books… she knew nothing of it. But in the books, Ossie is described also as good looking, and no one is aware of his real true nature until after the wedding. Morwenna also marries him in the books, out of mostly choice… there was no life-or-death blackmailing situation there. On the show… while obviously again troubled by Ossie and saying he makes her skin crawl, Elizabeth did try to instantly let him out of the marriage. As for her not being faithful to Francis, I say… how weird? His constant jealousy of Ross lead him to heavy drinking, gambling, discouraging her input or investigative thoughts (regarding the mine), and ongoing infidelity. Really sad. Elizabeth was obviously put off by these things, and I don’t blame her for not enjoying their marriage, until after Francis’ turn around. At which point I think Elizabeth was nearly perfectly happy. I’m still jaded because of Francis’ death! At the end of the day, we know that Ross loved Elizabeth, and thought very highly of her moral fiber and her looks. I trust Ross and his impeccable judgment of character. I say Elizabeth was a wonderful young woman who got dealt a very bad hand, got jaded for a hot minute, and then did her best for those she loved, despite it. In the books, we never see anything from Elizabeth’s own perspective. It’s always through someone else’s eyes. We don’t necessarily know what makes her tick, or what’s going on in her mind. I think that’s unfortunate. In the books, we never see anything from Elizabeth’s own perspective. It’s always through someone else’s eyes. That is only true of the second and third novels - "DEMELZA" and "JEREMY POLARK". The other novels do feature Elizabeth's point-of-view. I'm surprised that no one has ever noticed. I have always liked Elizabeth. I believe one of the reasons is that like her, I am something of a reserved woman. And I have noticed over the years that people are not that tolerant of reserved women. Worse, they tend to make the worst assumptions about them. I am not one of those who believed that Elizabeth had emotionally manipulated Ross before the May 9, 1793 incident. Not in the novel, "Warleggan" or in Series Two of "POLDARK". It was only right that she informed Ross of her upcoming marriage to George. He was head of the Poldark family, Geoffrey Charles' cousin . . . and he had been helping her (somewhat) maintain Trenwith. Remember . . . both Ross and Francis had made a deal with each other to look after their widows if anything should happen to them. And in the "Warleggan" novel, Elizabeth not only informed Ross, but also Verity. If there is one thing I have to be critical about Elizabeth, it was her role in coercing her cousin Morwenna into marrying Osborne Whitworth. However, I believe she is not solely to blame. George is definitely to blame. But Elizabeth did not hesitate to help. In "The Black Moon", Ross did not seem interested in helping Drake's romance due to his unwillingness to get involved with George . . . or his in-laws, until after the France rescue trip. 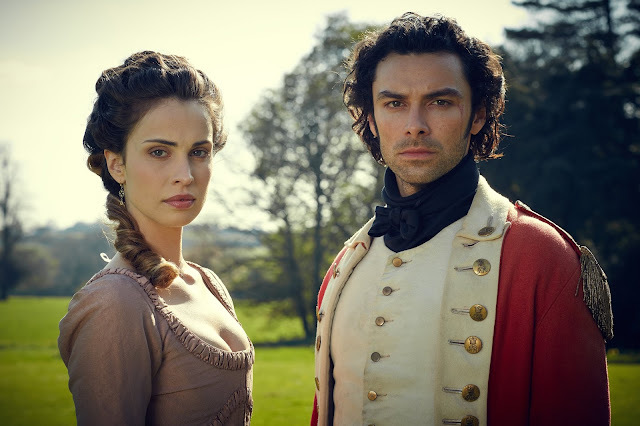 Although Demelza felt sorry for Drake and Morwenna, she was no more interested in supporting Drake's romance with Morwenna than Ross. In the recent TV series, producer Debbie Horsfield tried to paint Demelza's lack of support in a sympathetic manner, but I found this hard to buy. For those of you who felt that Elizabeth's point-of-view was never touched upon, I suggest you read the first novel again, along with anything between Warleggan" and The Angry Tide".